Flowering: Blooming Growth Rate: Fast growth rate Plant Group: Tree Plant Type: Deciduous Fall Color: Yellow-Gold Flower Color: white to Pink Mature Height: 15-25 Mature Spread: 15-25 Growth Rate: Slow Foliage Color: Green Sun Expose: Full Sun-Partial Sun Zones: 5-8 Ships: Bare root 6-12"
The Yoshino Cherry tree, Prunus X Yedoensis, has white or pink clusters of beautiful flowers that have a scent of almond. The flowers appear before the leaves. Total bloom time usually 10-14 days. These ornamental cherries are bred for flowers and fragrance instead of fruit. 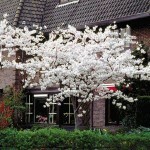 The lavish blooms of soft pink semi-double fragrant flowers cover the rounded-spreading crown of this cherry. These deciduous trees have glossy, dark green leaves which turn yellow in fall. Yoshino Cherry trees prefers full sun and well-drained soils. It is excellent as a border or mass plantings in an open area or as specimen tree. They are exceptionally showy with evergreens in background. It is the main cherry tree in the Washington tidal basin, common on US Capitol grounds and around the Library of Congress.